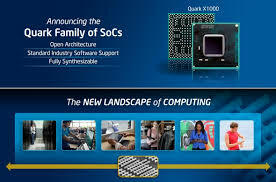 Brian Krzanich, Intel CEO, announced the new “Quark” processor at this year’s annual Intel Developer Conference. Public technical details are scarce at this time, but the general description of the device is that it is x86 compatible, one fifth the size of “Silvermont”, one tenth the power consumption of Silvermont and fabricated using 32 nm process. You can watch Mr. Krzanich’s complete 26 minute keynote address. In a new approach for Intel, a Quark core along with third-party SoC blocks will be used to make a complete Quark based chip. While designers will not have the ability to customize any of the silicon, they can configure block connections to best suit their end applications. Customers can also make performance, power and feature set trade-offs by selecting which blocks to use in a particular configuration. Given the ultra small size and power consumption numbers, Quark is intended to compete with embedded micros and single purpose type controllers. This will give Intel an entry into new consumer applications like wearable electronic clothing, smart watches and the general “Internet Of Things” market where all devices can communicate with one another. Quark also has far reaching possibilities for both the industrial and medical markets. With a very small power source, developers should be able to create human diagnostic capsules which can be swallowed. Intel hasn’t set a production release date, but it’s expected to be sometime in first half of 2014. Nor have they provided pricing details; Based on the lowest priced Atom at $42, Quark should be in the $10 range when in full production for high volumes.